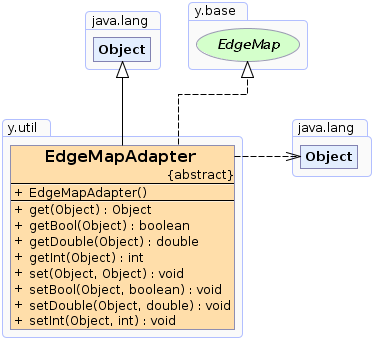 This class is an empty abstract implementation of the EdgeMap interface. Returns the value bound to the given edge. Returns the boolean value bound to the given edge. Returns the double value bound to the given edge. Returns the integer value bound to the given edge. Associates the given value to with the given edge. Associates the given boolean value to with the given edge. Associates the given double value to with the given edge. Associates the given integer value to with the given edge. The value must have been associated to the given edge by a call to setBool. The value must have been associated to the given edge by a call to setDouble. The value must have been associated to the given edge by a call to setInt.